Who invented Anesthesia? The name of the person credited with inventing Anesthesia is Thomas Green Morton (1819 - 1868). William T. G. Morton is not only famous as the American inventor of Ether Anesthesia but also as a dedicated dentist. When was Anesthesia invented? William T. G. Morton invented Anesthesia in 1846 when he gave the first successful public demonstration of ether anesthesia during surgery. The invention of Anesthesia originated in America and is considered a paramount achievement in the field of Medicine. Definition of Anesthesia: Anesthesia is defined as an anesthetic medication that induces the total, or partial, loss of bodily sensation to pain and touch, with or without loss of consciousness. The word 'anesthesia derives from the Greek word 'anaisthesia' meaning "loss of feeling". Fact 1: Who invented Anesthesia? 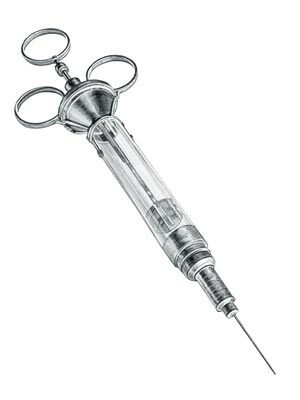 Anesthesia was invented by Thomas Green Morton in 1846 during the First US Industrial Revolution era of inventions (1700 - 1860). Fact 2: Who invented Anesthesia? What are the different types of anesthesia? There are three main types of anesthesia that are administered so that the patient patient is unable to feel pain - General, Local and Regional. Fact 3: Who invented Anesthesia? General: A General anesthestic makes the patient unconscious, unresponsive, unable to feel pain and may also have amnesia. Fact 4: Who invented Anesthesia? Local: A Local anesthestic numbs one small area of the body and the patient stays awake and alert. Fact 5: Who invented Anesthesia? Regional e.g. Epidural: The third type of anesthesia is a Regional anesthestic, such as epidural anesthesia, which blocks pain in a specific area of the body of a conscious patient. Fact 6: Who invented Anesthesia? Anesthetic medicine is inhaled as a gas through a breathing mask or tube, or given through an intravenous (IV) line. Fact 7: Who invented Anesthesia? Prior to the invention of Anesthesia in 1846, much minor or major surgery was performed on people who were wide-awake. Frequently restrained by straps unfortunate patients were often held down on the operating table by men who had to ignore the patients pleas and screams so that the surgeon could do his job. Fact 8: Who invented Anesthesia? The pain endured by patients prior to the invention of Anesthesia was horrific but there were also significant dangers, many resulting in death, due to the lack of cleanliness in the operating room and the terrible infections which would overcome the patient following surgery. Fact 9: Who invented Anesthesia? The germ theory of disease, establishing the relationship between germs (micro organisms) and disease, was not discovered until the 1880's when Louis Pasteur (1822 - 1895) and Robert Koch (1843 - 1910) provided convincing evidence of the relationship. Consequently, most surgeons during the early 1800's did not understand the necessity of the thorough washing of hands, surgical instruments and the operating table as a basic requirement prior to surgery. Fact 10: Who invented Anesthesia? William T. G. Morton's discovery was not immediately acclaimed by the medical world or the public due to high mortality rates following surgery due to unhygienic practices. Surgeons were also used to communicating with patients during surgery and were reluctant to work on an unconscious patient. However, the opportunity to perform painless surgery with the use of ether anesthesia quickly gained the medical world’s acceptance of surgical anesthesia. Fact 11: Who invented Anesthesia? The inventor of Anesthesia, Thomas Green Morton, was born on August 9, 1819 in Charlton, Massachusetts, United States and died on July 15, 1868. Fact 13: Who invented Anesthesia? Following his education he established a dental practice in Boston in 1844. His partner was another dentist called Horace Wells (1815 - 1848). Horace Wells began to experiment with the pain-killing properties of nitrous oxide ("laughing gas"). Nitrous oxide , or laughing gas, was discovered in 1772 by the English chemist Joseph Priestley and in 1799 the British scientist, Sir Humphry Davy, discovered that Nitrous oxide made him laugh, and feel less pain - hence its nickname of 'laughing gas'. Fact 14: Who invented Anesthesia? Horace Wells demonstrated the method of using "laughing gas" at the Massachusetts General Hospital in January 1845 but the demonstration was a dismal failure. His patient failed to respond to the "laughing gas" and Horace Wells was ridiculed. Fact 15: Who invented Anesthesia? The partnership between Horace Wells and William T. G. Morton quickly ended as Wells became unstable due to frequent inhalation of chemical vapors. Horace Wells underwent a complete personality change, he was jailed for throwing acid at a passer-by and committed suicide on January 24, 1848 at the age of 33 years old. Fact 16: Who invented Anesthesia? William T. G. Morton, working with a physician called Dr. Charles Thomas Jackson, continued the quest to discover a way to conduct painless dentistry. On September 30, 1846 William T. G. Morton anaesthetised a patient called Eben H. Frost by the inhalation of sulfuric ether and successfully removed an ulcerated tooth painlessly using Ether Anesthesia. Fact 17: Who invented Anesthesia? On October 16, 1846 William T. G. Morton gave a demonstration to doctors of ether as an anesthestic during surgery at Massachusetts General Hospital. William T.G. Morton instructed the patient, Edward Gilbert Abbott, to inhale the fumes from an ether-soaked sponge. After Abbott was sufficiently sedated, a surgeon, Dr. John Collins Warren removed a tumor from his neck. Fact 18: Who invented Anesthesia? The patient Edward Gilbert Abbott felt no pain during the surgery, which amazed the doctors and medical students. After the ether demonstration the surgical theater at Massachusetts General Hospital was nicknamed the Ether Dome, and it has been known by this name ever since. Fact 19: Who invented Anesthesia? William T.G. Morton and Charles T. Jackson applied for a patent on November 12, 1846, for an 'Improvement in surgical operations' with the use of ether, impregnated with essential oil providing a combination of ethereal and narcotic vapors producing the state of insensibility. Fact 20: Who invented Anesthesia? On November 12, 1846 the famous American poet, Oliver Wendell Holmes, wrote to William T. G. Morton suggesting the word 'anaesthesia' to describe the mental state produced by the inhalation of the ether vapor. Fact 21: Who invented Anesthesia? Letter patent No. 4848 was issued for 10% of all profits on the use of ether in surgical operations. This caused an uproar in the medical community and Jackson and Morton quickly made their discovery known and freely available to all and the use of ether anaesthesia spread around the world. Fact 22: Who invented Anesthesia? Following the invention of anesthesia, a Scottish doctor, Sir James Young Simpson (1811-1870), discovered the anaesthetic properties of chloroform in 1848 and pioneered its use in surgery helping to popularise chloroform for use in medicine. Fact 23: Who invented Anesthesia? In 1859 an Austrian doctor and ophthalmologist called Karl Koller introduced cocaine as a local anaesthetic for eye surgery. Cocaine later became the first effective local anesthestic. Fact 24: Who invented Anesthesia? The American Civil War (1861 - 1865) erupted and William T.G. Morton became a volunteer surgeon with the Union Army of the Potomac and applied ether anesthesia to more than 2000 wounded soldiers. Fact 25: Who invented Anesthesia? William T.G. Morton died on July 15, 1868 following a stroke and was buried at Mount Auburn Cemetery in Middlesex County, Massachusetts. He will be remembered as the inventor of ether anesthesia and his efforts to introduce painless surgery. Who Invented Anesthesia? - Thomas Green Morton - Inventor - Invention - Definition - Meaning - Famous - Important - Anesthesia History - Anesthesia Timeline - Innovation - Significant - Development - Medical - First - Definition - Kids - Anesthesia Facts - Information - Info - Who invented Anesthesia - Dates - When - Why - Impact - Purpose - Use - New - Old - Amazing - Best - Anesthesia Definition - Meaning - Awesome - Cool - Anesthesia - American - History - Timeline - Who Invented Anesthesia?